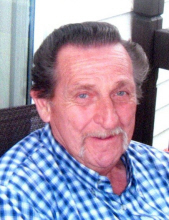 Celebrating the life of Jay F. Largent, Sr.
Obituary for Jay F. Largent, Sr.
Jay F. Largent, Sr. age 84 of Rossford, Ohio passed away on Tuesday, April 9, 2019 at Hospice of Northwest Ohio in Perrysburg. He was born on July 22, 1934 in Three Churches, WV to Jesse and Beulah (Haines) Largent. Jay married Alice Alexander on January 29, 1955 and together they raised four children. He was employed as a truck driver for over 30 years having worked for Holland Motor Express, National Transit, Thayers and Libbey Owens Ford Glass. Jay was a devoted family man, enjoyed Nascar, his dogs, bonfires and cookouts. He was a loving father and grandfather who will be dearly missed. Surviving are his children, Jay Largent, Jr., Jayne Largent, James Largent, Janet (Robert) Duty; brother, Wallace Largent; grandchildren, Amanda (Morris) Lewis, Courtney Largent, Hilary Largent, Anthony (Karla) Largent, Jared (Julia) Largent, Jaymes (Bethany) Largent and Megan Largent; great grandchildren, Colton, Carter and Brandon DeAnda, Laila, Kennedy, Keaton, Keely, Adalynn, Josiah, Ariana and Ethan Largent. Also surviving are many nieces and nephews. Jay was preceded in death by his parents; wife of 49 years, Alice; brothers, Eugene and Blake Largent; and sister, Alma Likens. Family and friends may visit at the Sujkowski Walker Funeral Home, 830 Lime City Rd., Rossford, OH on Sunday, April 14, 2019 from 2-7 PM. Funeral services will be held on Monday, April 15, 2019 at 11 AM in the funeral home with Pastor John Bailey officiating. Interment will follow at Ft. Meigs Cemetery in Perrysburg. The family would like to offer special thanks to Jackie Batdorf, Ann Bodenstadt and Cheryl Largent. Memorial contributions in Jay’s memory may be directed to Hospice of Northwest Ohio. To send flowers or a remembrance gift to the family of Jay F. Largent, Sr., please visit our Tribute Store. "Email Address" would like to share the life celebration of Jay F. Largent, Sr.. Click on the "link" to go to share a favorite memory or leave a condolence message for the family.